Time is the always forgotten dimension of warfare. In Battles from the Bulge it deserves a level of attention that likely matches the one real operation planners pay to it. Not only time flows seamless in this game (no turns) but also the orders you give to your units will take some time to be executed (orders delay). 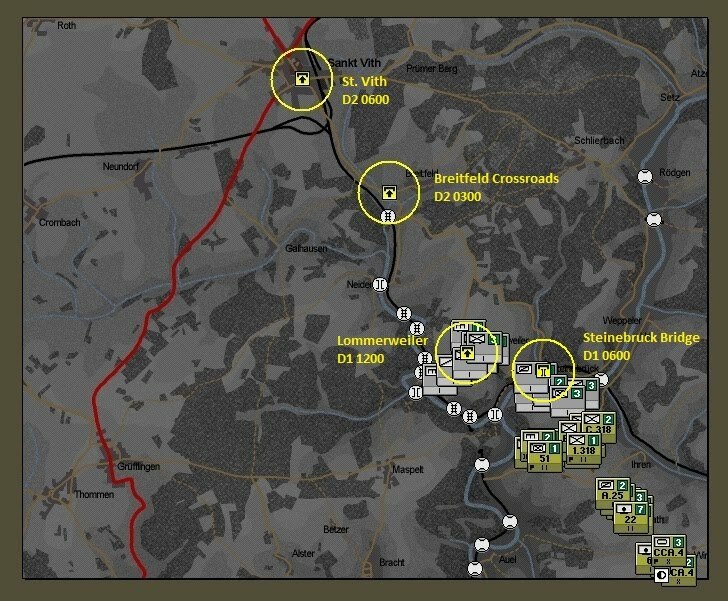 The terrain objectives of this scenario are timed: we need to take them at a certain time to get the most victory points. I usually don't take these timings like I'm running a train line that needs to be at a certain station by certain time. Yet, I keep an attentive watch at those timings. Pun intended. The next screenshot shows the terrain objectives and the times where they become active. The other timed events are reinforcements. As you may remember from my previous post, we will get reinforced with a brigade at day 2 and another brigade at day 3. Now, onto the plan ... for goodness sake! Some nice clear and concise bitesize pieces on BftB, well done Sir! Thx for pointing out the "Fighting by Minutes" book - interesting. I've put a link towards the book & your site on SB.com (although most ppl over there already know about your blog). Thanks gents for your comments and patience for the lack of fresh posts.